When he’d been a mere boy she’d been the one in charge but now that Viktor (Johannes Meyer) has grown into the temper-ridden titular Master of the House who manhandles his own wife and children, Viktor’s former nanny turned friend of the family Mads (Mathilde Nielsen) is as mad as hell and she’s not going to take his tyranny any longer. Scheming with his mother-in-law who refuses to bribe Viktor with a dowry-like payment to treat her long-suffering dutiful daughter Ida (Astrid Holm) better, the two elderly women decide to stage an intervention instead. Hoping to give Viktor a rude awakening in order to bring about the tyrant’s fall (that just so happened to be the name of the Danish play upon which Carl Theodor Dreyer’s 1925 silent film was based), they persuade Ida to temporarily leave her place at the heart of the home raising their three children and answering his every beck and call to make him see the error of his ways. Although the hardworking, sweet-natured Ida was hesitant to walk-out – going as far as to argue that her husband had been going through a tough time and she couldn’t abandon him when he needed her the most – it wasn’t until she helped her son with his vocabulary lesson and came across the definition of “tyrant” that she realized not only how much Viktor had changed but also perhaps why she was so devoted to her pet caged birds. 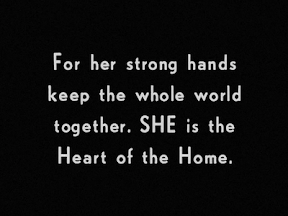 While from a contemporary standpoint it’s easy to draw a parallel between Ida as knowing “why the caged bird sings,” Dreyer referenced this very line of thinking from the earliest title cards of the film when he likened the apartments stacked on top of one another to thousands of nests. Subconsciously introducing the metaphorical idea of her as a trapped bird (and indeed perhaps Viktor as a broken-winged bird who due to failure aka inability to fly had taken out his frustration on his family), Dreyer collaborates wondrously well with his screenwriters but moves on at lightning speed in a remarkable opening sequence so we don’t dwell on the reference until it’s mentioned again. A groundbreaking technical achievement, in Master Dreyer married the American edit-heavy approach (which moved away from static German tableu lensing to incorporate medium shots and close-ups) with a theatrical chamber-play inspired technique to draw our eyes closer to the presentation as if we were seated closer to a raked stage. The film, which came out the same year as Eisenstein’s Battleship Potemkin may not get nearly the amount of credit it deserves both in comparison to Potemkin as well as the rest of the Dreyer's enviable oeuvre that’s usually synonymous with The Passion of Joan of Arc, is nonetheless an overlooked marvel both from a cinematographic and humanistic perspective. 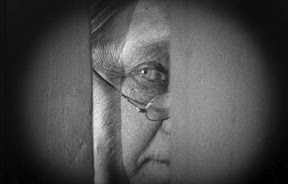 A silent film dazzler, Master of the House employed more than 11,000 cuts in its 107 minute running time which was far more than any other Danish film of the period. Given the content, it’s hard to look at the film (which is better known in Denmark as Thou Shalt Honor Thy Wife) as anything but ahead of its time in its feminist wakeup call and tribute to the world’s most difficult and unheralded role as a wife and mother. Nonetheless, given the context of the 1920's offered by this highly informative Criterion release, we discover that there was nothing controversial at all about Dreyer’s work which was perceived to be a charming domestic comedy. 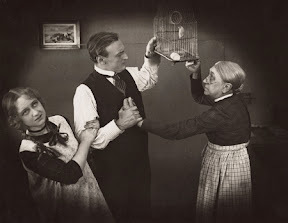 One of those films wherein the tone and weight of the picture changes with time, needless to say it’s hard to view scenes of domestic abuse today with the same lighthearted air with which it was intended in 1925. Nonetheless the film’s dramatic timbre and rich commentary on hardworking households (especially after we learn that part of the reason Ida has run herself ragged is from secretly working by night after her husband’s business fails) feels timelier and more universal than ever. While the interview with Dreyer historian Casper Tybjerg is fascinating as it reveals an alternate set of English language translated titles released in England upon the work’s international debut that goes against the point of the entire movie, for me the most engrossing film school worthy extra was historian David Bordwell’s richly-detailed visual essay. 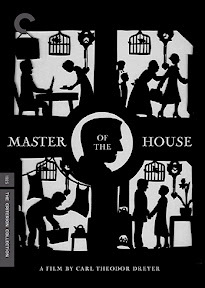 Walking you through the layers of the film while dissecting shot composition and going further back in time to illustrate the method and inspiration behind the movie’s innovative style, Bordwell enriches your understanding and appreciation of this often overlooked Dreyer masterpiece, released on Criterion in time for Mother's Day.